Martin Creed, Work No. 928, 2008, courtesy of The Guardian. As part of the Edinburgh Arts Festival, Fruitmarket is honoring one of Britain’s most popular and esteemed artists, Martin Creed, in a major solo exhibition of recent and newly-commissioned work. 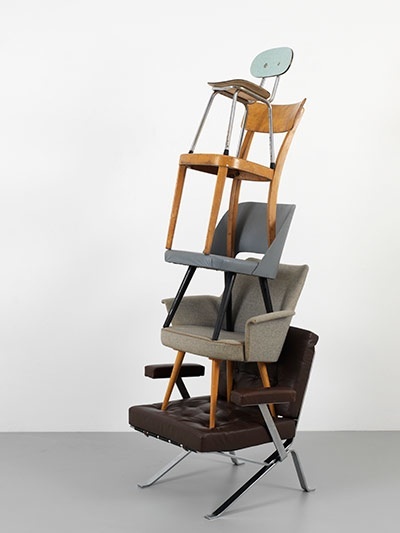 Entitled “Down Over Up,” the show focuses on basic visual properties like the differentiation of size, proportion, and tone of everyday objects such as chairs, tables, boxes, and Lego pieces. 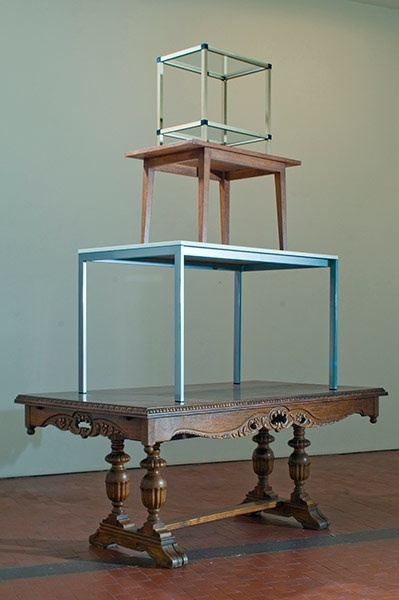 Creed has often been criticized for the accessible quality of his materials and technique; while this aspect of his practice is visible in “Down Over Up,” the artist has also incorporated more conventional art forms such as paintings, drawings, and sculpture into the exhibition. 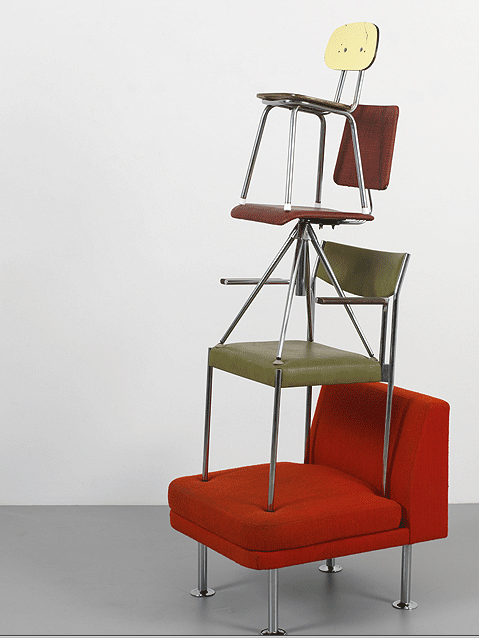 Creed initially won critical acclaim for his minimalistic sculptures, in which he rearranges everyday objects. He manipulates the common as a material representation of his primary preoccupation: modern culture. The artist often creates work in order to elicit particular responses from the viewer, by deploying a spectrum of motifs ranging from the absurd to the familiar. When entering the exhibition, the first work the viewer encounters is a neon sign over the entrance suggesting that “Everything Is Going to Be Alright.” Comforting and witty, this work brings Creed’s background as a musician, poet, and conceptual artist to the forefront and prepares the viewer for a display of work combining candid humor and thoughtful commentary. Creed often makes a point to create work which blurs traditional distinctions between fine art and utilitarian objects. While his art is sometimes criticized for its sparring qualities, the concept behind it is anything but minimal. He strives to demonstrate that aesthetic beauty can be composed from ordinary, pre-existing materials. The work in “Down Over Up” that most clearly conveys this goal are his sculptures fashioned from store-bought wood planks. 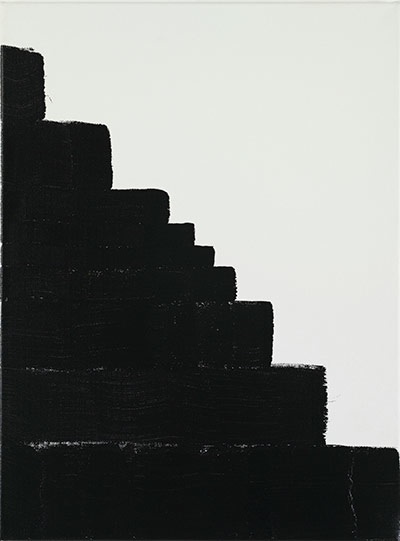 Their treatment of themes such as measurement and progress is a recurring motif in “Down Over Up,” where Creed also explores his obsession with steps, intervals, increments, progressions, and regressions. Curated by Fruitmarket’s Fiona Bradley, the exhibition spans two floors of the gallery. While Bradley and Creed were preparing for the show, the artist was simultaneously engaged with a monumental commission to renovate the nearby Scotsman Steps. This staircase is an outdoor landmark linking Edinburgh’s old and new towns, notoriously considered to be an uncomfortably narrow decent. Creed plans to transform the experience the Scotsman Steps into an elegant space of bilateral mobility. Each of the one hundred and forty stairs will be inlaid with a unique marble slab from around the globe. A project reminiscent of the Renaissance, Creed’s goal is to create a small tribute to our world, so that utilizing the staircase becomes an international voyage. The project will be completed later this year, and serve as a cosmopolitan homage to Edinburgh’s historical significance. Creed’s initial designs for the Scotsman Steps included a plan to transform the monument into a musical synthesizer staircase. While the project was untenable for the outdoor space, Fruitmarket commissioned an adaptation of this staircase for the gallery, which now integrates the first and second floors of the show. This commission was supported through the Scottish Government’s Edinburgh Expo Fund, and will remain at Fruitmarket as part of the permanent collection. As visitors ascend or descend the staircase, each step sounds a different note on the musical scale, creating unique melodies contingent upon the visitor’s pace and the population in the gallery. Martin Creed, Work No. 997, 2009, courtesy of The Guardian. Martin Creed, Work. No 998, 2009, courtesy of Telegraph. Martin Creed, Work No. 508, 2006, courtesy of The Guardian. Bradley chose to explore Creed’s interest in staircases throughout the exhibition, particularly through paintings like Work No. 508. Every positive plane creates a negative one beside it, and every ascending staircase creates a descending one above it, in an elegant display of balance and order. Martin Creed, Work No. 960, 2010, courtesy of The Guardian. 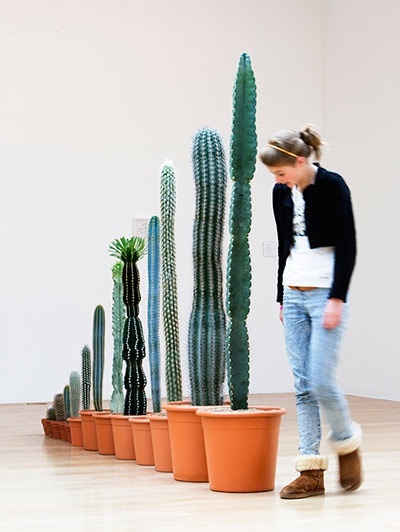 Also displayed is an installation composed of thirteen different potted cacti, ascending in order by height. Here Creed addresses the tension between systemization and spontaneity. While the cacti are precisely arranged, their identities are individual and idiosyncratic. 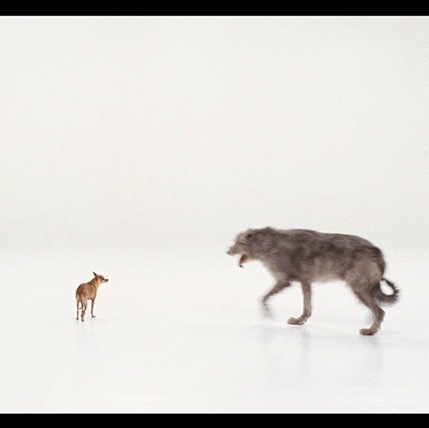 Another work in the show that addresses this dichotomy is a video in which the artist and a friend follow two dogs, one small, and one large. The characters move around a bare studio in a row. By staging this performance in the artist’s studio, Creed transforms an ordinary experience into one of surprise and unanticipated humor. Martin Creed, Still From Work No. 670: Orson & Sparky, 2007, courtesy of The Guardian. Martin Creed, Work No. 1020, 2010, courtesy of The Guardian. Outside the exhibition, the nearby BBC public monitor displays an ongoing screening of Work No.732: Flower Kicking. Also coinciding with the show was a performance of Creed’s Ballet, Work No. 1020, presented by Sadler’s Wells and Fruitmarket at Traverse Theatre, as part of the 2010 Edinburgh Festival Fringe from August 8th through the 15th. This work also plays with the notion of progression and the ordering and reordering of the mundane experience. 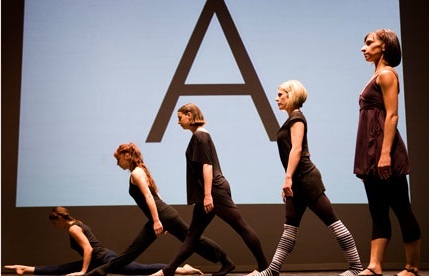 Based around the five primary positions in ballet, and the notes on the musical scale, Creed lines up five dancers by height, similar to his cactus installation. Each of the dancers is repeatedly performing ballet movements in one of the five positions, with a musical note applied to each movement. A live band performs the musical accompaniment, with Creed as the guitarist in the ensemble. Creed’s exhibition is woven throughout the urban fiber of Edinburgh. Earlier this year, Thames & Hudson published a major survey of the artist’s work. He was the recipient of the 2001 Turner Prize for Work No. 227: The Lights Going On and Off. In 2008, he accepted the Duveen Commission at Tate Britain and presented Work No. 850, a performance piece in which runners sprinted through the museum space in thirty-second intervals. Both of these works enjoyed overwhelmingly positive critical response. This entry was posted on Friday, August 27th, 2010 at 3:56 pm	and is filed under Go See. You can follow any responses to this entry through the RSS 2.0 feed. You can leave a response, or trackback from your own site.